← Policy Tourism – a crass mistake? 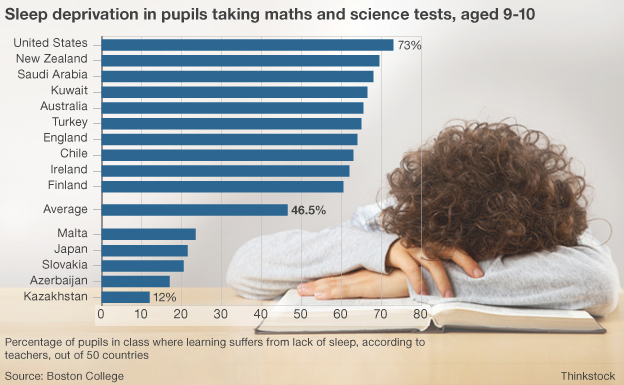 For quite some time now (certainly back to my own experience at school 50 years ago), teachers have worried about the sleep children get overnight, between the 8 hours they spend in school. Now let’s be clear, back in the 1960s I did not have electronic gadgets, the nearest to that being a torch under the blanket and a crystal radio. But I did share my bedroom with 5 or 6 other boys as boarders in term time at school, and my goodness me we were up for mischief if allowed. What made the difference then, and what guided my own actions as a parent subsequently, is that the adults around knew above all that children needed 9 hours sleep at night. And they were rigorous in enforcing it, perhaps a little too harshly on occasion with a big stick, but the general premise held true – children need lots of sleep. Now that general statistic holds true to the present day, but parents seem to find it increasingly difficult to persuade their offspring of this need. Indeed, the more highly developed the country, the more affluent the household, the more likely it is that children will not get the sleep they need to be high-performers the next day. As the graph from the Boston College (US) shows – about 3/4 of our children show signs of sleep deprivation. Curing this is not simple of course, because you can’t say to a child who is still wide awake, ‘time for bed’ – the child needs to have been engaged in a raft of activity during the day to have exercised the body and mind, and in addition, you must have engineered a winding-down period of about an hour to ensure the child is ‘prepped’ for sleep. 1. No gadgets for the last hour, no iPad, TV, Xbox or similar. The brain processes ‘hot images’ from screens in a different place to paper, so reading for pleasure needs to come off a cold screen, like a book or magazine. I don’t know that the LCD screen of a kindle counts as hot or cold, but the whizzier the device, the more likely it is that other distractions are but a click away. 2. Time to get ready for bed then. This is a process. To be followed every night (Sunday to Thursday) in term-time, and for a week before the new term starts. 3. Check all is ready for school, then perhaps a warm drink of milk and fruit snack (diverts blood from the brain to the liver, via the intestines – improves feeling of well-being and reduces Oxygen to the brain) , and then the ritual of teeth brush, wash-up and jim-jams. 4. Some adult/child quiet time together, sharing a story, reading a book together, in the child(s) bedroom, ‘warming down’ the child. Always done, never delegated to trust. 5. Quiet reading before lights out allowed, but certainty that lights do go out in good time. And check, don’t trust. Teenager adjustments – because of course they grow up and ‘it’s not fair’. ‘Life’s not fair, so get used to it!’ was often heard in our house. Texting their friends, Facebook and so forth are all ‘stay awake activities, so phones are off and no TV/PC/Laptop/slates in the bedroom allowed. Keep the routine. Give them more control on getting things ready, so that’s them making the packed lunch or ironing their shirts, cleaning their boots and packing their bag. Still spend some time with them to calm them down, talk with them, do some philosophy stuff from P4C or your own faith group. You didn’t have children to ignore them, nor plan to keep them subdued with a digital cosh from XBox or Apple, did you? I know I invariably had work/stuff to do after the ‘men’ were in bed, but it was important that the grown-ups acted right. It could be argued that set 4 students demonstrate signs of fatigue, for instance, focus, processing ideas and so on. As a Teaching Assistant one can scribe, enthuse and support struggling boys but more importantly hint at life style choices or study skills, so they enable themselves. I agree with the above wholeheartedly. Whilst parents believe their teens are asleep, they are actually on their phones on facebook or shoot ’em sites where they are building a world , unsuspecting parents think they in the land of nod. These are behaviours that can be quickly stamped out and improve attainment levels. This would address many fatigue-related issues in the classroom. Some parents confind apathy about school or homework to their children, which totally demotivates their efforts and makes them come across as sleepy. If parents read with their children half an hour before bedtime we would have a nation of alert learners. Sometimes one or two lowest ability students may suffer with medical fatigue due to epilepsy or the like. They may describe their symptoms as low mood, stress or depression. These are students whose retention or behaviour is a worry. Occupational therapy to simplify tasks at work and home. Physical therapy to develop a regular exercise program. Sleep regulation, which might involve treating symptoms that interfere with sleep and using sleep medications on a short-term basis. Psychological interventions, such as stress management, relaxation training, membership in a support group, or psychotherapy. Heat management—strategies to avoid overheating and to cool down.